More than 600,000 white British Londoners have left the capital in a decade"
This is nonsense. The true figure for the number of white Londoners who've left is far higher - once again, the Mail confuses net with gross figures. Even assuming that we are only talking about Londoners moving from the capital to other parts of the UK (that is, ignoring international emigration, much of which may be non-British and/or non-white), the ONS' best estimate is that about 240,000 people moved out of London in the single year ending June 2011 - over a decade, that adds up to well over 2 million. In a new paper published today in the latest issue of the National Institute Economic Review, economists David Bell and David Blanchflower of the University of Stirling and Dartmouth College introduce a new measure of labour market slack. The conventional measure of the difference between supply and demand in the labour market is the unemployment rate. But it does not capture a phenomenon which has become increasingly important during the current recession - underemployment. Immigration is down. So are exports. Wednesday's GDP figures confirmed that the UK economy shrank in the last quarter of 2012 – in large part because of the weakness of exports. So the government’s strategy of generating growth by rebalancing the economy towards investment (which is also weak) and exports is far from on track. But the government is at least making progress towards its objective of reducing immigration to the “tens of thousands,” with Wednesday’s figures showing net migration is down to the lowest level in four years. It was duly trumpeted as a policy success. Tomorrow's immigration statistics (Thursday 28 February) will be pored over for evidence of whether the government is making progress towards its "target" of reducing net migration to the "tens of thousands". The contradiction between the government's claims that the UK is "open for business" and the policy measures required to meet the target - essentially, measures to reduce the number of skilled workers from outside the EU and foreign students - has been highlighted elsewhere (for example, by the Conservative MP Gavin Barwell in the Telegraph). For a longer explanation of why a flexible immigration policy is an essential part of any serious growth strategy, see my article here. "Domestic demand is now rising. Although this is not the first time that "green shoots" have been observed, it nevertheless remains likely that the economy will begin to recover this year...The main threat to this outcome is the recession in continental Europe, where German monetary influences are still forcing policy to be unsuitably tight for domestic purposes. A substantial portion of Britain's trade is with this bloc, and we could still suffer an unpleasant backwash from Europe's problems." 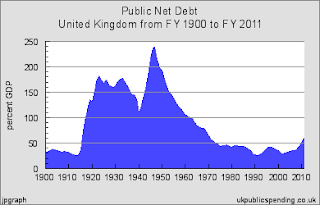 "The public finances are in a substantially worse state than anyone expected this year. This was because GDP growth did not emerge, leaving the economy smaller than it was expected to be. We anticipate borrowing for this year will be about 7 per cent of GDP. .."
Since the government has already announced its public spending plans, and since it is likely to have considerable difficulties in hitting these plans, most of this budgetary tightening will almost certainly have to come from higher taxation...Our view is that significant tax increases will be necessary if the public finances are to be brought under control." [This blog, by NIESR Principal Research Fellow Alex Bryson, summarises the articles published in the February 2013 special issue of the National Institute Economic Review on China's economy]. China’s political future has been settled – for the time-being – with a new cadre of political leaders taking over nearly 3 months ago. But its economic future appears less certain. With annual GDP growth projected to remain below 8 per cent some commentators are revisiting debates about the sustainability of China’s economic growth. Here we point to a number of factors that suggest China's economy remains in pretty good shape to face many of the new challenges it faces. World growth remains below trend at 3.3 per cent in 2013 and 3.7 per cent in 2013, little changed from our previous forecast. World trade will only grow slightly faster, and again below trend. The Euro Area will grow only slightly next year, while Japan is forecast to grow by 1.4 per cent, the US by 2.4 per cent, and China by 7.3 per cent. Interest rates will remain extremely low by historical standards, and inflationary pressures will remain subdued. The economy, after seeing zero growth in 2012, will grow by 0.7 per cent in 2013 and 1.5 per cent in 2014. Consumer price inflation will average 2.4 per cent this year and 2.3 per cent in 2014. Unemployment will stabilise at about 8 per cent, and to begin a sustained fall in 2015. We expect public sector net debt to peak in 2016–17, at about 85 per cent of GDP.